The gallery of photos you are looking are are all pieces I have sold. I sell my artwork at live shows and venues as well as custom orders directly from this website. If you see something you like or are interested in, you can contact me through e-mail, texting or simply give me a call. I welcome all custom orders and would be happy to discuss your ideas. 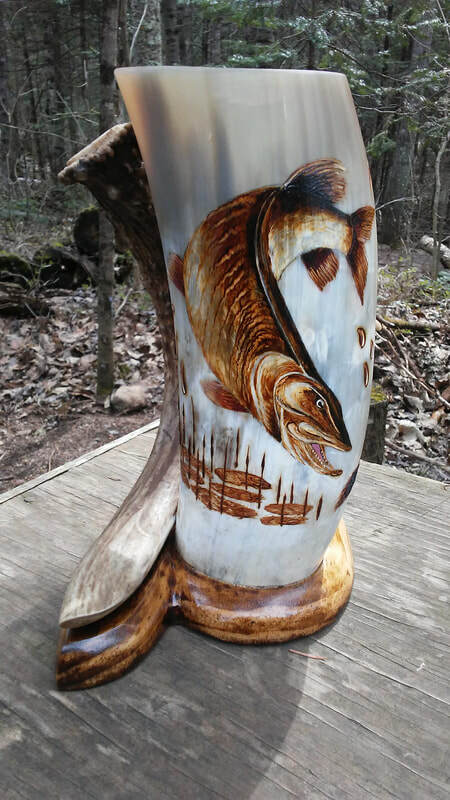 The mugs I create are made from Texas longhorn horns, whitetail deer antlers and Monterey pine wood. Each horn as well as the antler handle is hand selected for its shape, size and color. The wooden base is hand carved to fit the symmetry of the piece. The antler handles are individually selected to match or what I call "flow with the horn." The inside of the horn is coated with a food-grade sealant that is custom made for the mugs. Each piece can be used for hot or cold beverages. The artwork or images on the horn are burned on by hand using wood burning tools. I can design anything on a mug including working directly from a photograph. The colors on the horn are all natural and become very visible as a result of polishing the horn. Do not place any of these items in a microwave as it will damage and warp the horn. Dishwashers are not recommended. You can simply hand wash the mug or cup like you would any other dish or glass.